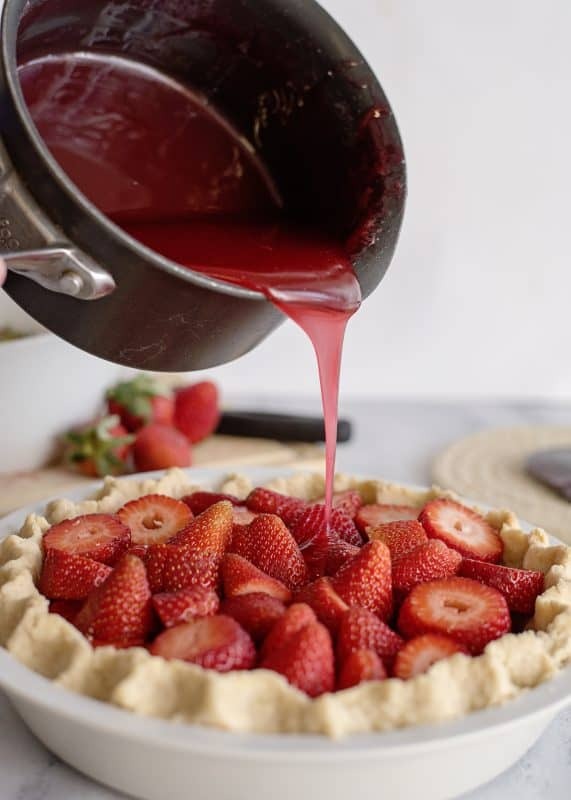 There is nothing like a homemade fresh strawberry pie! I know I’ve brought you an awful lot of sweets lately and some of you may be wondering where my family puts all of these desserts! I can answer that question simply enough, we put them elsewhere! Usually, when I make a dessert, we’ll take out two pieces of it. The prettiest gets photographed and then eaten by the male parental unit and the second one gets halved by the kiddies. After that, everyone knows Mama has more desserts to make within a few days so we give the rest away to neighbors, friends, or family. 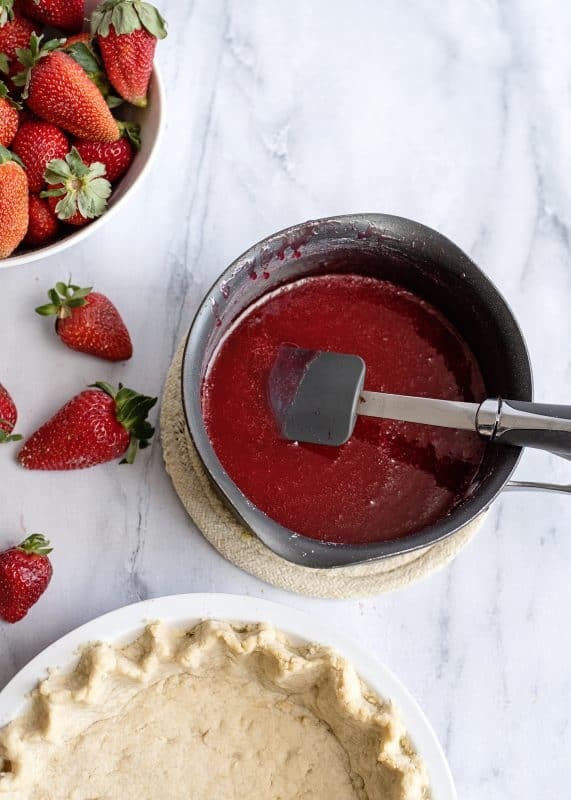 I generally try to make something sweet on Fridays because that allows us to enjoy it for our Shabbat supper and take anything left to our Fellowship group on Saturday. I go through phases in my posting. Sometimes I get on a casserole or main dish kick, sometimes I get on a roll with sweets. I’ve found that I’m happiest when I just allow myself to post whatever I’m in the mood to write about as this helps me to keep having fun with things rather than get burned out. Seeing as how this is going to be an incredibly busy week (meetings at school, dentist and doctor appointments with two kids, deadlines, etc) I was really just in the mood to post this pretty pie – so here ya go! If any of you have ever had the strawberry pie at Shoney’s or Big Boy restaurants, this is likely looking pretty darn familiar. As well it should because it is very similar to that pie – only better. Using my quick and easy mix in the pan pie crust, you can throw together this gorgemous pie quick as a wink! 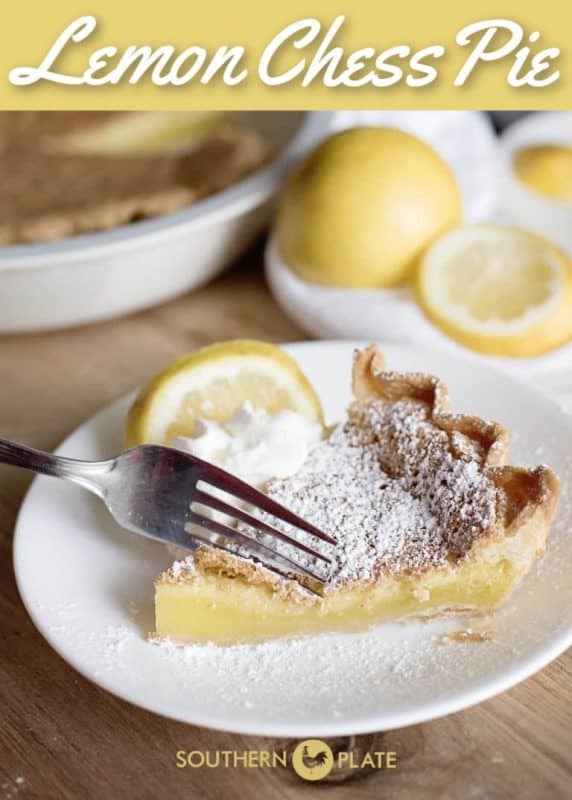 This would be a beautiful dessert on any table – especially at family gatherings such as reunions, Mother’s day, or cook outs! 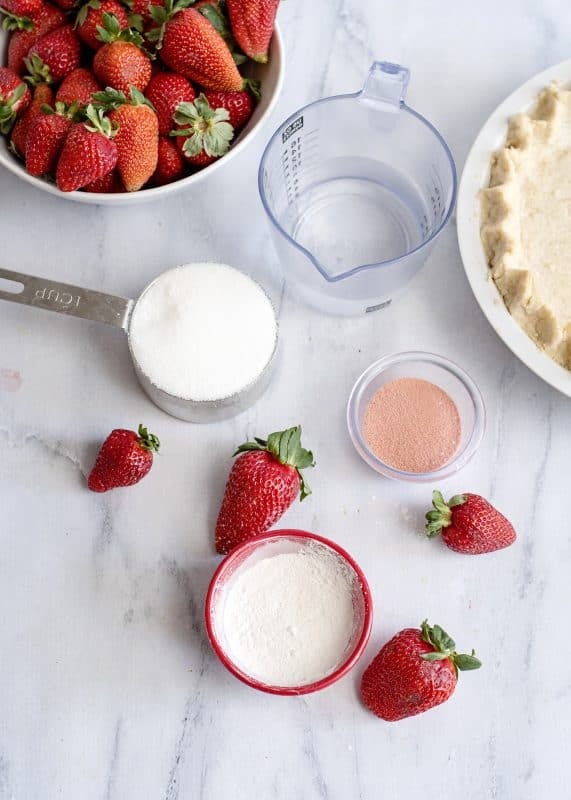 You’ll need: Fresh strawberries, strawberry gelatin powder, cornstarch, and sugar. Rinse your strawberries and cut the tops off. Also remove any bottoms that are on the un-pretty side :). Slice each strawberry in half. 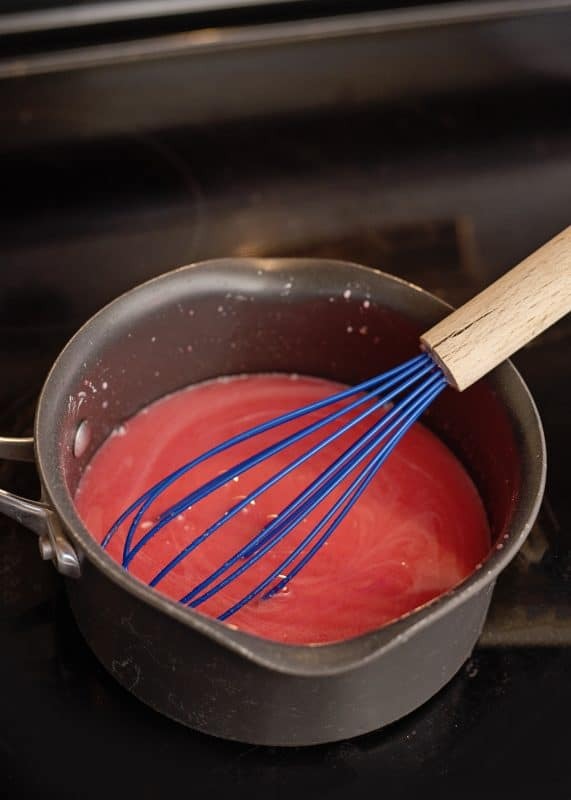 In a sauce pot, place your sugar, strawberry gelatin mix, three heaping tablespoonfuls of cornstarch. Stir that up. Add water and place over medium to medium high heat, stirring constantly. Yes, this means you’re going to have to stand there for a minute. I like to take this time to close my eyes and have a little mental recollection session as I go over all of the thoughts I haven’t been able to complete on that particular day because they were interrupted by family members. Continue cooking and stirring this until it becomes clear and translucent as you’ll see in the next photo. Remove this from the heat and allow to cool to room temp. If you want to do this quicker, you can always fill a bowl with ice water and dip the bottom of your sauce pan down in it while you stir. You can also stick it in the fridge for a little bit. 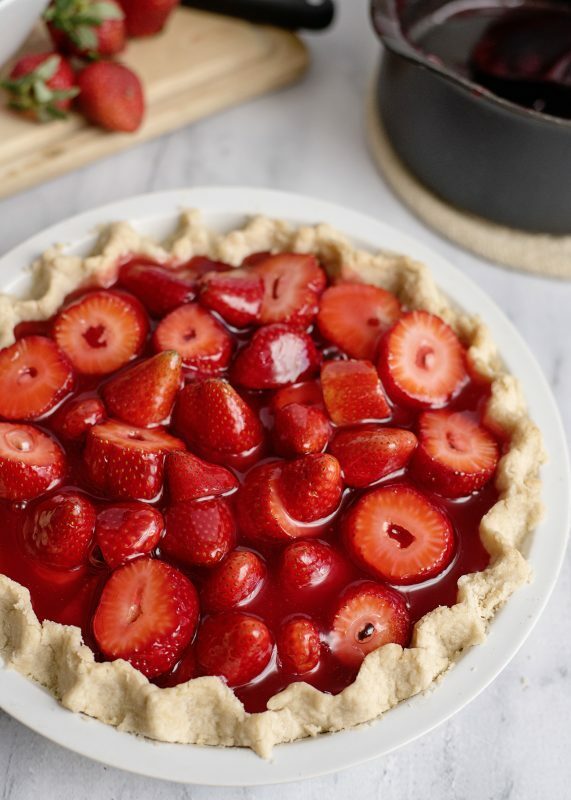 Layer your strawberries in the pie crust. Again, this is my homemade mix in the pan pie crust and its easy as…well, easy as pie, of course. Yes, I’m corny sometimes but in this day and age, corny can be refreshing. Don’t you think? When your liquid has cooled (room temp is fine), pour over the strawberries, making sure to cover them all. I couldn’t leave out this photo, either. Isn’t this a beautiful pie? I cover this and refrigerate it for several hours before serving. In fact, it works beautifully if you make it the day before. Right before serving, you can top with dollops of whipped cream, if you like. Nothing wrong with gilding the lily! 1 pie crust cooked and cooled (The recipe for my crust may be found here. I made a double recipe for a thicker, fluted crust. Combine sugar, cornstarch, and dry gelatin mix in a sauce pot and stir together. Add water and cook until thick and clear over medium high heat, stirring constantly to prevent scorching. Thanks Christy … you’re a sweetheart! You know, the day I made that pie two other friends made a strawberry pie as well!!! We are definitely all on the same wavelength!! Oh boy! I can remember the Shoney’s Strawberry Pie now! And of course, the Hot Fudge Cake! I just bought 2 quarts of strawberries today. I can’t wait to try this pie. You know, we still have one in our town. I haven’t been there in ages but we used to LOVE going for weekend brunch or on Wednesday nights when they have the breakfast bar! I need to go again! When I was in sixth grade, my birthday fell on a school day and Mama and Daddy told me I had a dentist appointment that day and checked me out around lunch. I honestly thought I was going to the dentist but instead, they took me to Shoney’s for lunch :). I always remember the hot fudge cake that day! Wow an easy semi healthy summer treat! Thank you so much! *drools* Even if My Son won’t touch it I will! Hey, this is one time that picky kids come in handy – more for you!!! Lol, picky son and my hubby didn’t want any!! I made two pies, (one was for someone else) I wound up using it as an excuse to go visit some people and had a great evening! Delicious! 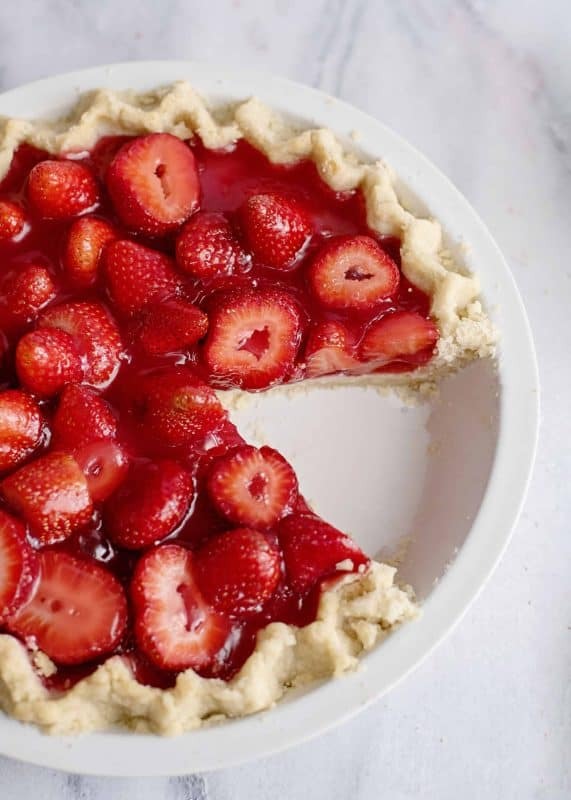 This pie looks so good and not hard to make at all! Strawberries aren’t in season here though, I don’t know if it would work as well with frozen? If you thawed them and drained them, the texture would be a little different but I bet it would work! I’d be sure to get the frozen whole ones, not the ones sliced and frozen in sugar and juice. Can’t wait to have you stateside, Su! I’ve seen that glaze! I have never bought it and primarily because, like you, I’m afraid I would just eat it all up myself! Do you have a recipe that you can use sugar free jello instead of full sugar jello? You know, I don’t and I really need to find time to adapt this one because I could happily eat the whole thing! I’m not sure how the cup of sugar in the filling would do with splenda as a replacement but my guess is that it would still gel as long as you used the sugar free gelatin. Whoever gets to try it first be sure and let us know and if its me you know I’ll report back!! You were so kind to mention my new MannersMentor blog in your post! Already SoutherPlate readers have come knocking on my door. You’re right, you do have the nicest blog family ever! I’m truly honored to partner with you, and I look forward to meeting you on your front porch next week! PS: There will be Strawberry Pie on the McKee dinner table Tuesday night! Yummy! I don’t know how I got so lucky but I am not about to question it! I’m the one who is honored! You’ve already added grace and joy to my life and I am thrilled to know you’re going to be doing the same for my readers!! Hope you’re having a great weekend, Maralee! I saw this on FB last night. I was just about to come to your website and try to find the recipe and there was your email in my inbox! Thank you for reading my mind! Yummy! That looks so-o-o good. That’s the same recipe my mom and I use. Is there anywhere around Athens with homegrown strawberries this year? Im waiting for some. Hey! I usually get mine at Isom’s when they come in. Right now we’re left with Wally World and Publix though. When Isoms brings ’em, they’ll put a big old sign out at the road and you need to get at least twice what you need so you can eat as many as you want on the way home 🙂 . This pie looks WONDERFUL, I wonder if you could substitute the fruit and gelatin flavors to make a different one, I happen to love fresh peach pie, and I bet we could make that using this recipe. Robert, I think a peach pie made like this would be absolutely divine. Divine, Divine, Divine, Divine, DIVINE!!!!!!!!!!!!!!!!!!!!!!!!!!!!!!!!!!!!! So you’d best be saving me a slice!!! That pie looks great! I really like the word you used to describe it too “gorgemous”. Is it something you invented or has it been in your family for years. lol. I have a word we use “beautimous” We have been using it for years in our family. Sometimes you have to just get special about the description. I love that you are putting quotes on them now. 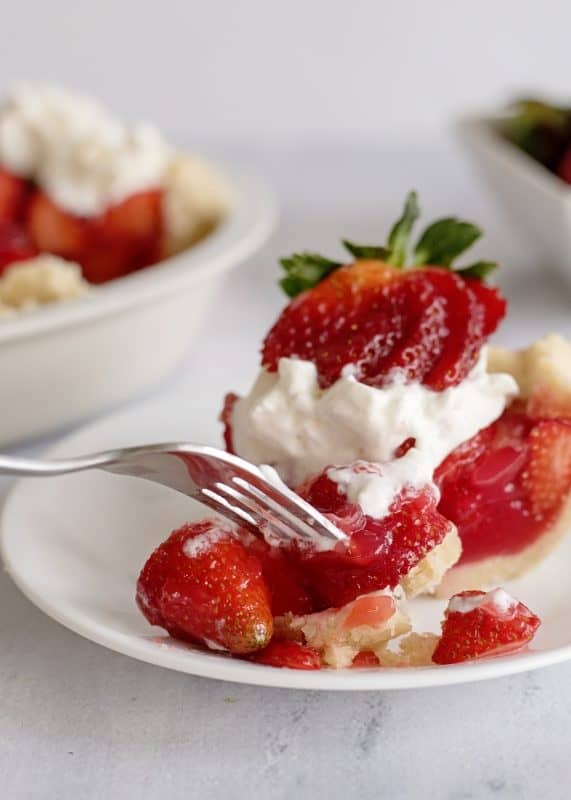 I just happen to have some fresh strawberry’s and I’ll tell ya right now that berry pies are my all time favorite deserts, although the pecan pie mini muffins are not far behind. Take time to smell the Roses if you can. If not, have a nice big glass of your Iced Coffee (I Love that recipe also) and just enjoy your Blessed Life!! I am going to make this pie for Easter dinner; it looks so good! I think I may even experiment with other fruits (blackberries were on sale this week). This is the same recipe I have used for years although the heaping tablespoon thing always makes me nervous that I will overdo it. Ain’t it good though? Just might have to do one of these to go with the Easter Bunny cake. I am soo happy to see this post Christy. I love this pie and lost my recipe for it a long time ago. I’m pretty sure I made it with sugar free jello and it turned out. But I haven’t made this pie in probably four or five years so it’s hard to remember. I have a similar recipe except it uses 7-up and a whole box of jello! Mmmm! I have used sugar free jello with great success (of course, I’m using the whole box so there is no measuring involved). My favorite dessert! 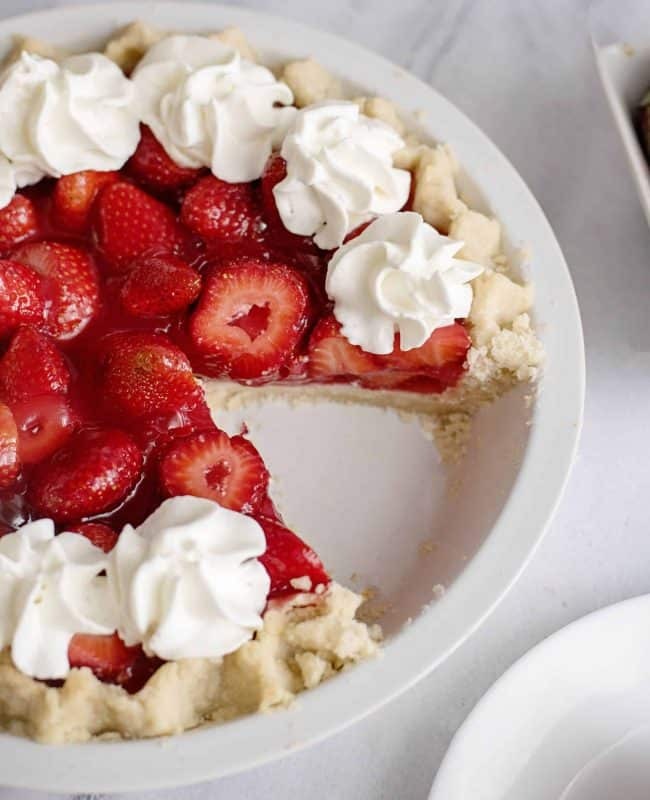 So, I’ve never had strawberry pie before – but this looks amazing! Thanks for this recipe… can’t wait to try it! 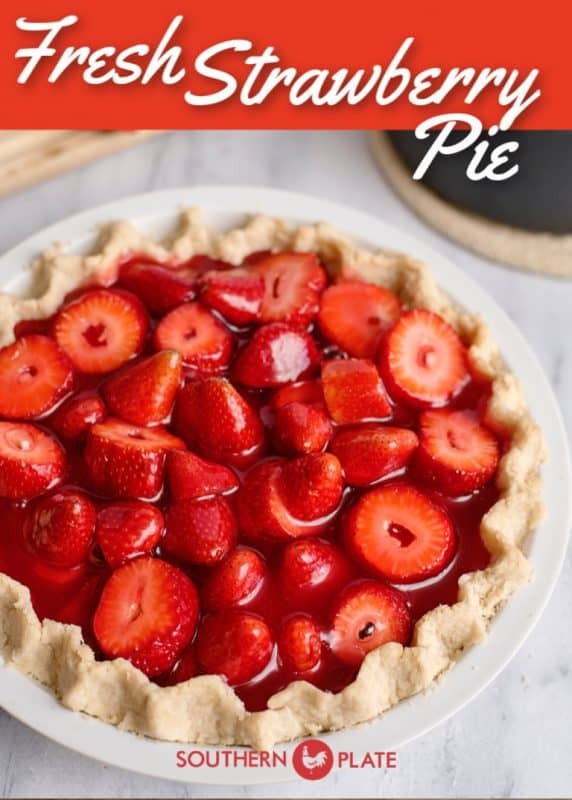 I remember having wonderful strawberry pies as a youngster that had this wonderfully no-way-its-natural red gel for the filling. I tried it the other day and was in for a shock… it no longer tastes good! It was very chemically (is that a word?) tasting. *very disappointed face* SO.. now I GOTTA try yours! I made this already and it was a hit! I made two and shared with the in laws, who are having a pretty rough week. It really brightened their evening! 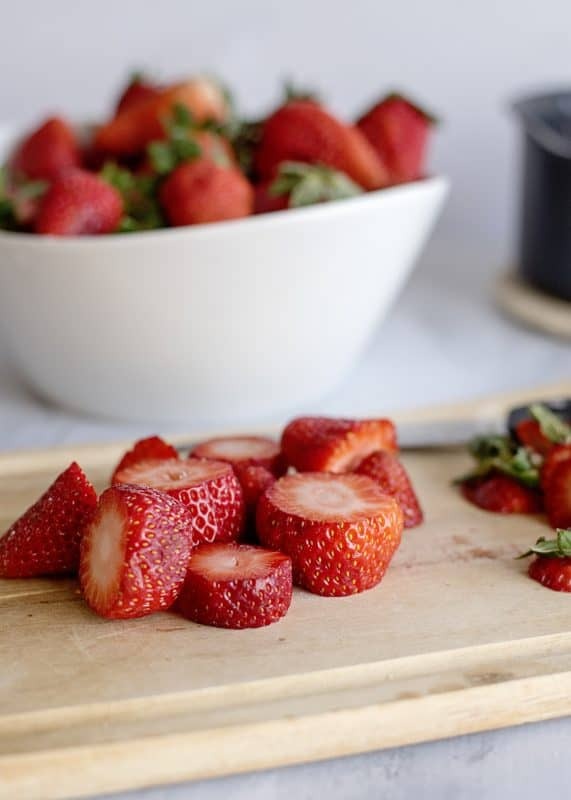 My in-laws just came back from Gulf Shores and brought us a huge pan of strawberries … now I know what to do with them! oh dear. 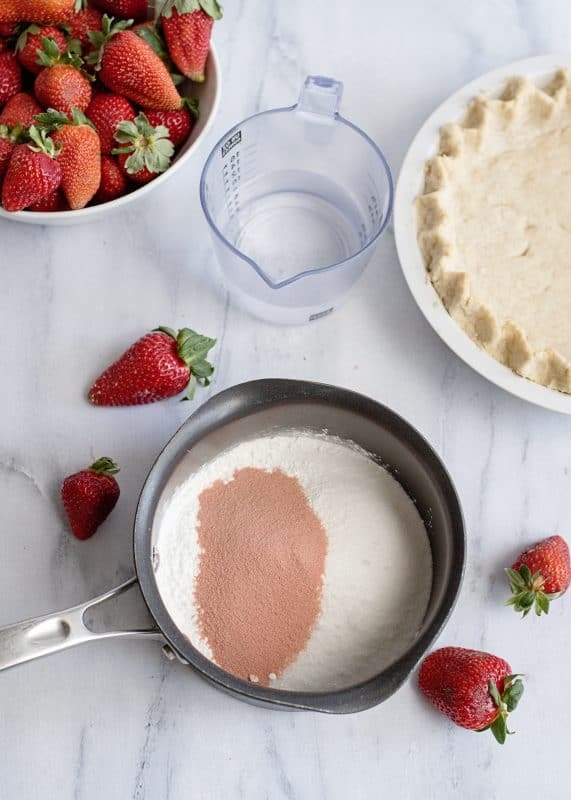 Not only will my Friday night NOW consist of this strawberry pie making but i clicked on that OTHER link, i’m also going to be making that lime pie one too!! (p.s.- i’d also like to point out that my previous plans this evening were to go country dancing, but am now JUST as excited to be doing this instead…I chalk this up to NOT being old but instead, excited about your blog! Oh, this looks so yummy. Our strawberry plants are starting to get flowers on them, which means I’ll have lots of yummy strawberries very soon! The sad thing is that my five year old can’t have it due to the artificial coloring in the Jello. Any ideas of something I could substitute for the Jello? Would strawberry preserves work? I just hate to make things that he can’t have. Makes me feel like a bad momma. A blackberry pie made in a similar way to this pie? Yummy! I made this today for Easter dinner. It turned out really good. I didn’t read where you did a crust and a half, so I will definitely do that next time. Crust was a little on the thin side but still great. Thanks so much for the wonderful recipe! I had the opposite problem! I did increase the crust recipe by half and it came out too thick in some spots! Maybe I should have tried to push it up higher on the sides and make a fluted edge, but that was too much trouble! My pie pan is also glass so maybe that affected the outcome. The crust was kind of mealy rather than flakey. Not bad, just not what I was expecting. The filling was very good. 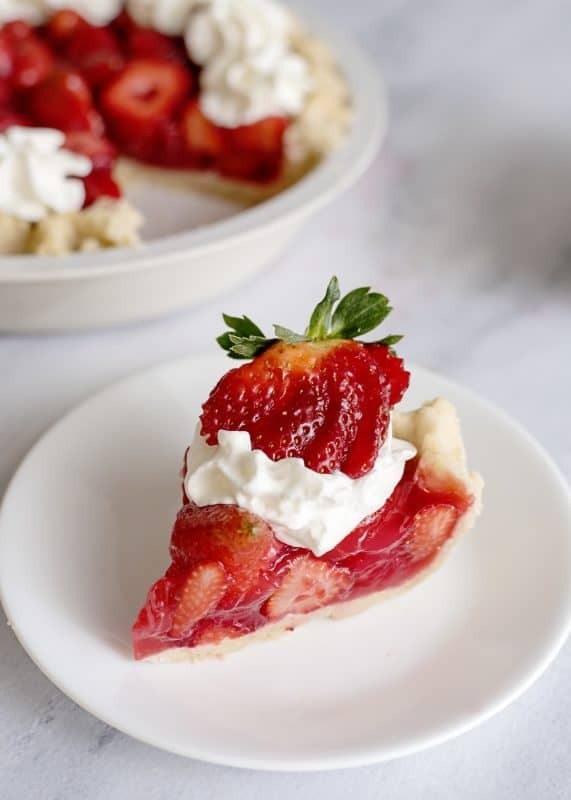 Christy, I made the fresh strawberry pie for Easter and it was a big hit! 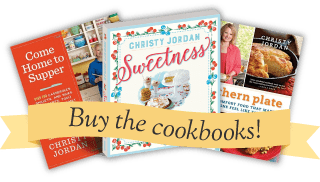 I have to tell you my “kitchen mishap” story (I intend to write a book one day on MY kitchen mishaps!). I bought two Mrs. Smith’s deep dish pie shells and baked them as instructed. When I was removing them from the oven, one of those little boogers slipped off my slick cookie sheet and plopped upside down on the kitchen floor! And while juggling the cookie sheet to try and save it, almost lost the second one! Well, I live about 10 miles round trip from a grocery store and wasn’t going back to town, so I made your “make in a pie pan” shell. 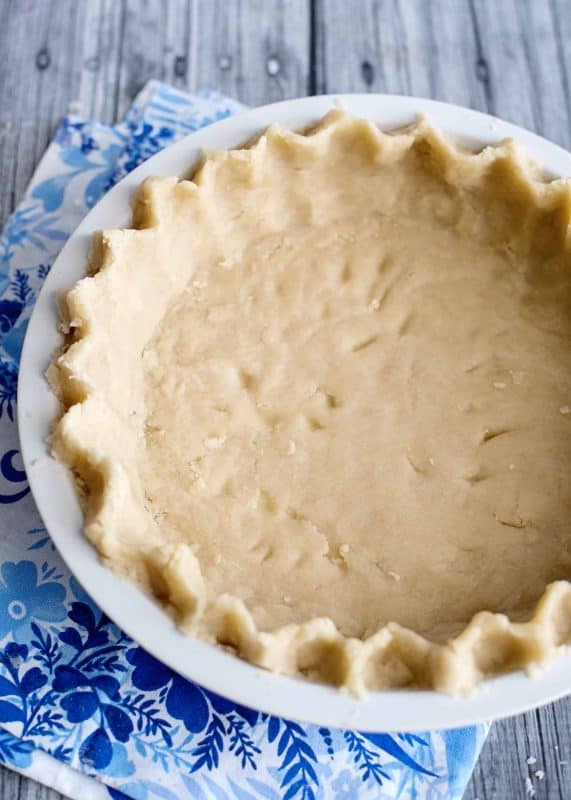 I served my Mrs. Smith pie shell first cause I wasn’t sure how my pie crust turned out… I’m not the greatest at pie shells… that’s why me and Mrs. Smith are real close! The entire pie was eaten and I was secretly glad that I didn’t have to serve the other one cause I have company coming in a couple of days and hope I can serve the pie to them! Also, made a key lime cake and it was a big hit! Love your recipes and commentaries! Wish you the very best in LA and with Kraft… who knows, we may see you in TV one day! The thing I love about your site is that it is REAL southern food… the stuff I grew up with, anyway, in the rural south. You stay true to it, right down to the bowl you serve your banana pudding in… yes, you can see the layers in a trifle dish, but real southerners always put it in a bowl or even Tupperware! Paula Dean is great… but anyone who wants to sample the most authentic rural southeastern food you can get, I would direct to your site. Love your sense of humor and positive attitude too. PS tried the cold coffee, awesome, THANKS for this recipe! I made this last week and followed the directions exactly. My problem is that it never thickened. The strawberry soup was great…but I’d love to have the real thing. Any suggestions you can give? Hi Christy! Thank you for this recipe! I made it for Easter and it was delicious! It will now be an Easter tradition at our house! And we loved the crust! Well, I tried this again last night and it “worked”! I bought a new box of cornstarch b/c the other had been in my cabinet for a while. I think that was the issue! 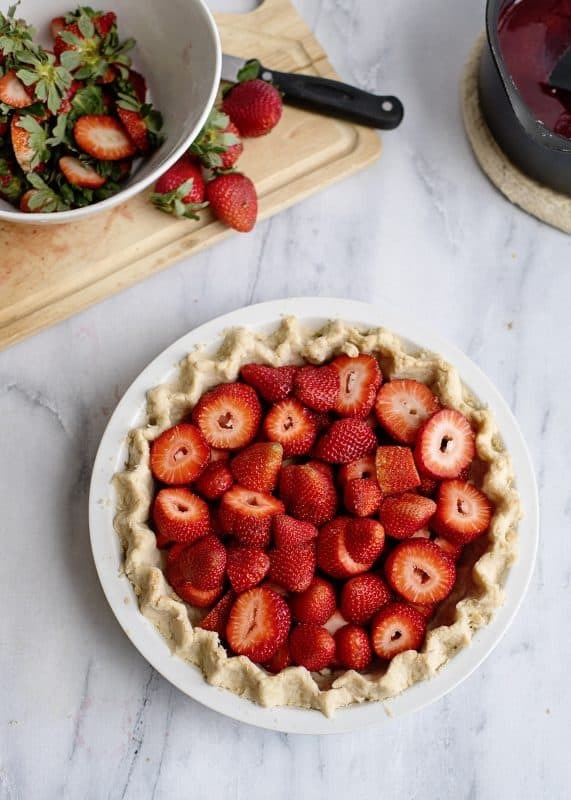 The pie is delicious with the fresh strawberries I brought back from vacation. Thanks for the great recipes!